The trailhead is located just past the Visitor Center on the righthand side of the road or you can park at the Visitor Center and follow the Montville to Visitor Center trail which is about a quarter mile long. From the trailhead follow the route for the Nature Trail and the Mosca Pass and Wellington Ditch trails. In a short distance the trail will begin a loop. 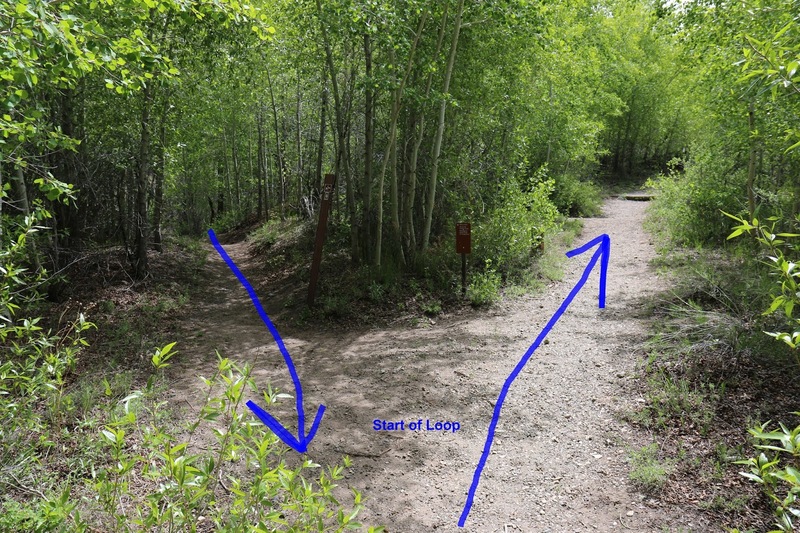 The righthand side of the loop is open to horseback riders that are presumably heading up the Mosca Pass trail. The peaceful treelined trail is easy to follow as it heads out from the trailhead. The loop can be hiked in either direction but to follow the numbered posts in order take the right fork. Since the townsite was destroyed by a flash flood there isn't much left to see but be sure to pick up one of the brochures at the trailhead or from the Visitor Center. The brochure will fill in valuable details about the interpretive trail. A bridge conveys the trail over Mosca Creek at the top of the loop. Immediately after crossing the bridge the Mosca Pass trail breaks off on the right. A few feet past that point and the Wellington Ditch trail branches off. The return side of the loop has more elevation change with parts of the trail that are also more rugged. There are good views of the sand dunes from the highpoint of the trail. This picture was taken around the first of June and the Sangre de Cristo Mountains still had a good bit of snow left on them. From the trails highpoint it descends several switchbacks and just before the loop comes to an end it recrosses the creek. 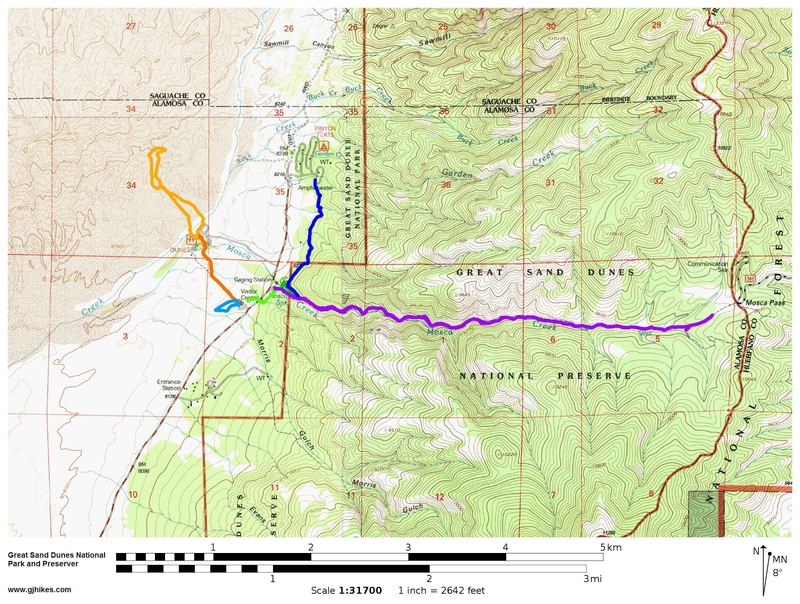 When we first visited the Great Sand Dunes National Park there were no trail maps or lists of hiking trails to go by. We were able to drive around and find the 7 trails that we have posted and several more that we will need to go back for. 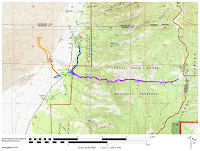 If you plan to do much hiking on your visit be sure to print out the map on this page and take it with you. As far as the Montville Nature trail goes, if you would like to see it for yourself then all you have to do is 'Take a hike'. * Some information about the town of Montville came from the book 'The Essential Guide to Great Sand Dunes National Park and Preserve' by Charlie and Diane Winger.